Lots to talk about, so let’s get started. Immediate thoughts upon finishing: “Now THAT was an ending.” I’ve written before about how endings of books or series often feel like afterthoughts, like the author planned in vivid detail the exposition, rising action, and climax and then threw a good enough but unsatisfying resolution onto the end and called it a day. 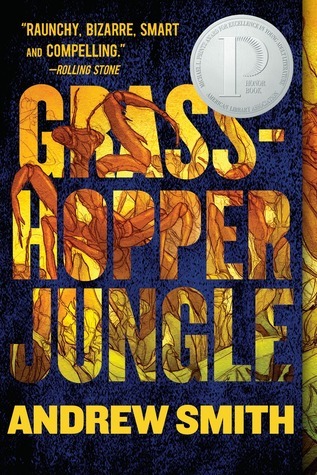 Smith’s ending to the long and complicated saga that was Grasshopper Jungle was completely unexpected and utterly satisfying. Since the Goodreads synopsis was wildly insufficient, I’ll elaborate by saying that the main character is sixteen-year-old Austin, who is navigating puberty in an ungraceful but painfully honest chronicle of what he calls “the end of the world.” Austin dates Shann. Austin is in love with Shann. Austin’s best friend is Robby. Austin is also in love with Robby. As if that isn’t complicated enough, Austin and Robby accidentally set in motion a series of events that lead to a world-wide epidemic and they’re the only ones who can save the world. Sounds familiar, right? Yes, it sounds like every other YA book where the world and the fate of humanity rests on only slightly qualified teens. That’s the popular fantasy: the hero’s journey; “in a world of 7 billion, I’m special.” I get it. We all want to feel like there is something that sets us apart, so it’s no wonder this is such a popular theme in YA lit. The thing about Grasshopper Jungle, though, is that it’s absolutely ridiculous and it knows it. Almost as though making fun of the hero’s journey, our narrator, Austin, is a freaking mess of a boy. He’s faced with the likely end of the world and all he can think about are typical teenage boy things; it’s unrealistic to assume that weight of the world suddenly forces maturity, so he’s thinking about the end of the world and also threesomes or whether presidents poop or what he should name his testicles or his Polish lineage. I’ve seen people criticize that it’s too weird and it jumps around too much. Yes, it’s weird; no doubt about that. Yes, it jumps around. Smith incorporates so much backstory and ancestry and parallel character lines into the story that, at times, he spends a whole page describing all the many ways that everything is connected. Without knowing it, everything, everywhere, and everyone involved is connected. If you go into reading this seeing the value in that, you’ll be fine. Let me be clear in saying that this book will NOT bee for everyone. Read this if you like and/or don’t mind the following: YA Contemp. Lit, small town stories, sexuality exploration, heritage exploration, hero’s journey, giant bugs, graphic detail, adventure, and action. It was a little long for my taste and I often had trouble relating, but I never had trouble enjoying it. Go ahead and start practicing your “sick” phone voice, because you need to call in sick to work tomorrow. Last summer I read Atwood’s The Handmaid’s Tale and had a lot of feelings. I’ve been seeing the *COMING SOON* ads for Hulu’s adaptation of the tale and I finally penciled in a day where the hubby was away long enough for me to binge the three released episodes. Reliving this story is, again, an emotional rollercoaster. I refuse to say that the show is better than the novel. Won’t say it. I WILL, however, say that they are so incredibly different that I can’t imagine how I existed with only one instead of both. I’ve been trying to think of how to verbalize how different they are and I think it hinges on seeing it. 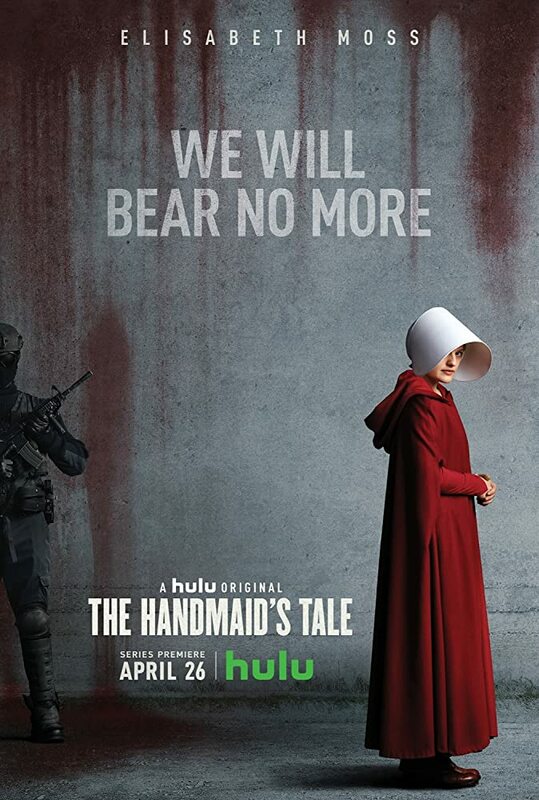 When you’re reading something, you visualize it; for Handmaid, visualizing it was about imagining what it would look like to be oppressed and owned. Offred gave detail in a way that almost felt blasé to me. I think that was purposeful, on Atwood’s part, since our narrator had been living in this oppressed state and was used to punishment going along with speaking out, standing up, or even remembering. Our narrator has to be cautious and callous, since failing to get her *ish* together could get her killed. I have never experienced Offred’s horrific circumstances nor have I (yet) lived in a society where I have anything but complete freedom. Thus, imagining and visualizing could only take me so far. The show, however, forces perspective. Offred’s experiences are right in your face, for better or for worse, so you MUST acknowledge them for what they are. Raw. A Dystopia at its finest. While the book allowed you to escape since it felt like it was all in the past, the show forces you to parallel the society with today, meaning that you, the viewer, have to acknowledge that this regression of freedoms is still entirely possible. It lays it all out via flashbacks and inner thoughts, detailing how the government tricked the public into thinking that a terrorist cell attacked and individual rights are being suspended in order to protect citizens. You see the brutality; you see the consequences; you see respectable individuals fight and beg for today’s basic rights; you see the 1% thrive and the 99% suffer. This is exactly the show that we all need to be watching right now. Has anyone else seen it? I got a lot of buzz on my review of the novel, so I’d love to know if those same souls and others have feelings on the show. Talk to me!